Yesterday, October 16 marks the 44th anniversary of one of the most memorable events at any modern Olympic Games. 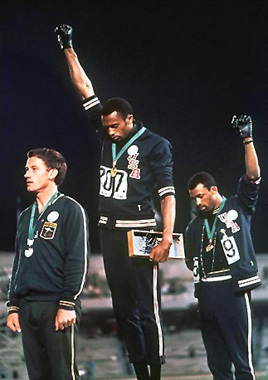 On October 16, 1968, silver medalist Peter Norman joined American gold medalist Tommie Smith – who had just become the first human to break the 20-second barrier in the 200-meter dash – and bronze medalist John Carlos on the victors stand for the awards presentation. Just five years earlier, Martin Luther King, Jr. led a quarter-of-a-million marchers on Washington D.C. and delivered his “I have a dream” speech, and just six months earlier, Dr. King was assassinated in Memphis. America had a long way to go to achieve racial equality, and the country needed the boldness of men of courage like Smith and Carlos. Raised in middle-class America, I was ‘programmed’ to register shock and anger like all decent people should, black, white, young, old… it made no difference. How dare these two black men – and I regret to say we didn’t refer to them as black men – insult the greatest nation on the face of the planet by such a disgraceful demonstration on the world’s greatest stage? The action was unforgiveable and unconscionable. I look back over those 44 years and I can see how my personal mentality has changed so very much, and it is due in no small part to great men who refused to compromise their deepest beliefs despite the consequences they would face by an uninformed society made up of people just like me. I was raised in New England and attended college in Colorado. I never spent time in ‘the South’ until 1971 when I drove my AMX from the Berkshire Hills to Valdosta, Georgia to attend USAF pilot training. Not far south of the Mason-Dixon line, I received my first HEAVY dose of racism. I pulled into a gas station and when I walked around the corner to use the restroom, I stood before three doors: MEN, WOMEN and COLORED. The memory lingers. I’ll not forget that image…. The signs are gone, but other hateful signs have replaced them. It’s time for all men, women and children of courage to become part of the answer, the real answer. We need far more Peter Normans who will not ignore the needs of his fellow human beings. Unfortunately, I believe each of us faces inequality on a daily basis. What do you think when you see a panhandler on the street corner? Do you try to ignore him? Do you really believe any human being can be illegal? Please follow this link to “The Good Men Project” to read an extraordinary article about Peter Norman and his Olympic experience.